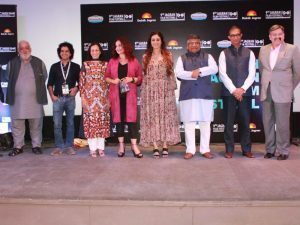 New Delhi: Union Law Minister Ravi Shankar Prasad, actors Tabu, Pooja Bhatt and others during the opening ceremony of 9th Jagran Film Festival in New Delhi. Lauding the role of films in bringing people together, he said: “I have always felt that films are the biggest bridge to connect mankind. Whoever the person, whatever the country or language, the emotions are the same. What films capture is the essence of the emotions. Prasad congratulated the organisers of JFF, a movie gala which will go to 18 cities for a duration of three months starting from Friday. The fest will travel to Lucknow, Kanpur, Allahabad, Varanasi, Meerut, Agra, Gorakhpur, Patna, Ranchi, Jamshedpur, Bhopal, Indore, Ludhiana, Hisar, Raipur and Dehradun before culminating in Mumbai. “Films will be stronger when the common man watches it,” said Prasad, who was the I&B Minister when the International Film Festival of India shifted to Goa from Delhi. JFF opened with “3 Idiotas”, the Mexican adaptation of Rajkumar Hirani’s “3 Idiots”. Some of the titles to be showcased at the gala include “Village Rockstars”, “Kadvi Hawa”, “S Durga”, “Bioscopewala”, “The Hungry” and “Ajji”. There is also a retrospective of Tabu’s works. Films like “Maqbool”, “Maachis”, “Iruvar”, “Kandukondain Kandukondain”, “Astitva”, “The Namesake” and “Cheeni Kum” are part of the schedule.